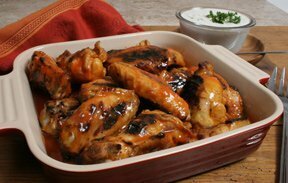 The spicy sweetness of these warm chicken wings and the cool tanginess of this tasty blue cheese sauce are a terrific flavor combination. They are sure to be a number one pick for all the Super Bowl fans. You may have cooked Beer Can Chicken on the grill but did you know you can also cook it in your oven? See our step-by-step guide. See how easy it is to make your own fresh guacamole for your Super Bowl Nachos.